Designed with versatility in mind our loungers are the perfect game changer. A new trend in home furnishings is emerging that involves ditching the traditional couch for a huge bean bag. 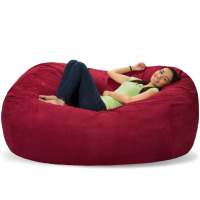 Our bean bags are made of high-quality furniture-grade polyurethane foam, the same material that is used in the best couches and chairs out there. 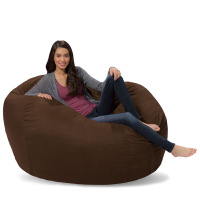 Unlike a traditional couch, a bean bag couch completely supports your body, no matter how you sit or lie. A bean bag cradles your body and eliminates pressure points, making it perfect for those with arthritis or other body pain that makes it difficult to sit for long periods. Bean bag couches can easily replace your current couch. 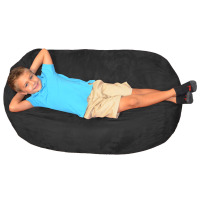 Comfy Sacks sells several sizes of loungers, a unique product that carries an oblong shape. Our 6 foot lounger, is about the size of a love seat and can comfortably seat two. The largest lounger is our 7.5 foot lounger, which is the size of a standard sofa and large enough for three or four adults. We also carry the monstrous 8 foot Sack. All of our bean bag sofas come with an easy removable cover that can be thrown into the washing machine. We invite you watch video footage of a Comfy Sack and a couch going at a head-to-head with a battle tank. Oh yes, we said a battle tank. All you have to do is decide what size bean bag you need, pick a color and a type of fabric (cotton or microsuede) and we'll ship your perfect piece of furniture to you in 5 to 10 days.